How are makers supposed to contribute to Fighting Ebola: A Grand Challenge for Development? 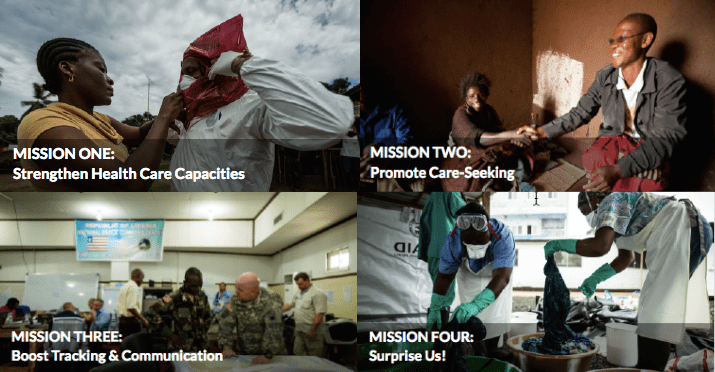 This high-urgency initiative against Ebola is focused around four missions. They’re not centered around medical science but around the healthcare worker, their ability to provide care and stop the spread of the disease. As you’ll see, these are areas where we makers can help. The wonderful care givers on the frontline must be further empowered and protected. Their Personal Protective Equipment (PPE) is cumbersome, hot, and uncomfortable which result in short work shifts, clumsy movement and potential exposure to Ebola. Their work environment and tools must be improved to provide better, safer care. This mission is ripe for maker innovation. Understandably there is fear of Ebola and in many instances aversion to seeking care. Help is needed to change behavior and encourage care-seeking, it’s key to stemming the epidemic. This is an area where creative makers can contribute to the pool of ideas. Measuring, gathering and analyzing data are second nature to makers and can help with decision making, resource deployment, and containment strategies. With all we do with micro controllers, sensors, actuators and communications this is a natural area for us to offer help. As with any good solution-seeking endeavor it’s open ended. Our community spends its time outside the box more than most so as we learn more we’re likely to have other helpful ideas. This mission is where ideas that don’t fit above will be captured. It’s a place where many makers will likely make contributions. Solving problems, that’s the kind of thing we’re really good at. Now is our chance to help stem a crisis which poses increasing threat. Let’s show the world what makers can do; go now and start contributing ideas.